From 12-25 February 2017, a team of DCO Early Career Scientists conducted field work across the Costa Rica volcanic arc. 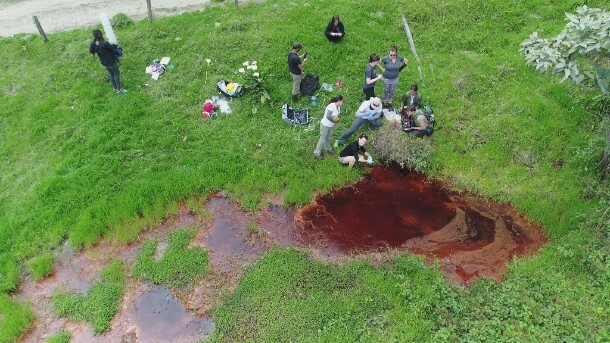 At hot springs and volcanic sites around Costa Rica, the team collected gases, sediments, tephra, and water in the cross-disciplinary DCO Synthesis initiative, Biology Meets Subduction. Read more about the expedition here. In a groundbreaking new paper, Edward Young (University of California Los Angeles, USA) and 23 co-authors from 14 institutions in 8 countries report the first resolved measurements of two rare forms of methane in gases collected from a wide range of geologic settings across the globe. These measurements provide unprecedented insights into the origins and evolution of methane, achieving one of DCO’s decadal goals. DCO Summer School alumna Suzette Timmerman (Vrije Universiteit, Netherlands) is the lead author of a new paper using diamonds to trace the evolution of the deep carbon cycle beneath Botswana through 2 billion years of Earth history. DCO field expeditions are making remarkable progress. Live From Costa Rica, Where “Biology Meets Subduction,” shares the excitement of a field expedition by 20 DCO Early Career Scientists to investigate the deep carbon cycle at the Costa Rica convergent margin from 12-25 February 2017. The Oman Drilling Project recently recovered excellent core samples of the sheeted dike/gabbro transition and has begun rotary drilling in the mantle section of the ophiolite. The application process remains open to participate in Oman drilling and core logging activities. We invite applications for the Third DCO Early Career Workshop to study Mt. Etna, Italy from 28 August-2 September 2017. As a reminder, DCO will be well represented at the Goldschmidt Conference in Paris and the abstract deadline is 1 April 2017. DCO continues to seek your input as it plans for the future. The Geochemical Society announced that DCO Executive Committee member and Deep Life Community co-chair Kai-Uwe Hinrichs (University of Bremen, Germany) has been named the 2017 Patterson Medalist. DCO Deep Life investigator Jill Banfield (University of California Berkeley, USA) has been named 2017 V.M. Goldschmidt Medalist. A new mineral, hemleyite, has been named in honor of DCO Executive Committee member Russell J. Hemley. The new mineral is a missing phase among predicted high-pressure polymorphs of Fe-pyroxene. Congratulations to Rus, who is now joined in solid solution with Syun-iti Akimoto. Expedition Blog: Embers Alight on the Trail By Fire 1.5! The Deep Carbon Observatory will hold its Third International Science Meeting at the University of St. Andrews. This meeting will showcase recent results from scientists working in all fields of deep carbon research. The European Geosciences Union General Assembly 2017 will bring together geoscientists from all over the world to one meeting covering all disciplines of Earth, planetary, and space sciences. The Department of Geology at the University of Georgia seeks to fill a position for a tenure-track assistant professor in the field of petrology/mineralogy, welcoming applications from scientists in both the Earth and planetary sciences to complement the department’s growing focus in planetary sciences. We encourage applications from petrologists/mineralogists with strong backgrounds in chemistry and physics who may employ unconventional and interdisciplinary approaches to address big-picture questions including, but not limited to, petrologic and/or mineralogical aspects of planetary evolution involving core, mantle, and/or crustal processes. Open until filled.